The newest season of Young Justice has continued expanding the DC Universe in surprising and exciting ways, adding a lot of fan-favorite characters in the fight against the Light. After Batman and his allies quit the Justice League, we have seen the Caped Crusader's adventures expand to include characters like Spoiler, Katana, Metamorpho, and many more. But one of the newest episodes of the series introduced a new member of the Bat-Family. In the episode "Another Freak," the young heroes Halo and Forager attend their first day of school at Happy Harbor High, with the New Genisian bug getting an old fashioned glamor charm courtesy of Zatanna. The charm makes him look human, and he adopts the name Frank Fred Bugg (with two Gs). During their first day of school, the new students' strange quirks make it difficult to for them to socialize, which isn't surprising considering Halo's amnesia and the fact that Forager is an alien. But they do make a friend with Another Freak in Harper Row. If that name rings a bell, it's likely because the character played a major role in Scott Snyder and Greg Capulo's run on Batman during the New 52 era, with Harper later becoming the latest member of the family as Bluebird. The tech-savvy teen aids Gotham's vigilantes in the series Batman Eternal, though she eventually drops the mantle of Bluebird in the followup Batman & Robin Eternal. She plays a lesser role in DC Rebirth, but does form a strong friendship with Cassandra Cain AKA Orphan. 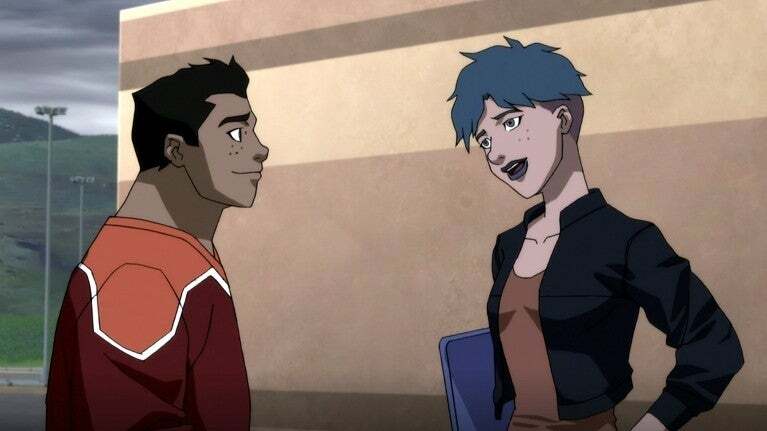 So far, she hasn't shown any aptitude for superheroics in Young Justice: Outsiders, but has become a friend to Halo and Forager in their high school journey. But as we've seen in the case of Malcom Duncan and Karen Beecher, simply being associated with the Team could lead to a superhero career. Those two characters ended up joining the squad as Guardian and Bumblebee, respectively. Batman has already recruited a large number of allies, including Batwoman, Nightwing, Oracle, Robin, Spoiler, Orphan, Arrowette, Katana, and Metamorpho. There's also heavy teases toward Jason Todd's return and the birth of Damian Wayne. Will Bluebird join the heroes in the future? We'll likely find out in the future, especially if the series gets picked up for another season and does another time jump.